Do you love brown sugar and cinnamon? 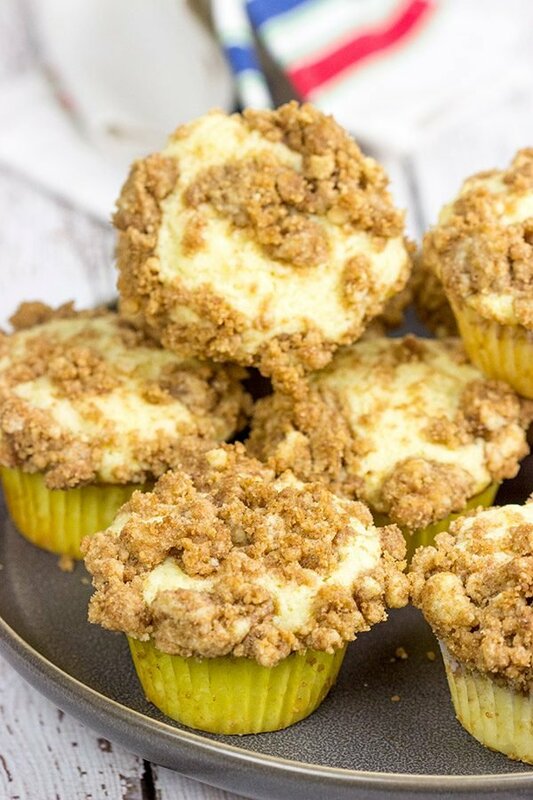 Then these Crumb Cake Muffins are calling your name! They’re packed with flavor, and they can be served as breakfast or dessert! Let’s take a trip down memory lane to high school. More specifically, to the high school lunchroom. My high school had an outdoor courtyard area, and we were allowed to eat lunch outdoors as long as the weather was nice. I always brought lunch with me to school. As a senior, we were allowed to go off campus, and we’d go to a nearby sandwich shop once a week. But every other day? I brown-bagged it. Literally. My lunchbag was a brown paper bag. In elementary school, my Mom used a black marker to write my name on the bag along with a smiley face. As I moved into middle and high school, the name and smiley face disappeared. For some reason, high school boys didn’t have smiley faces drawn on their lunchbags each day…imagine that. Robbie’s preschool includes lunch, so I haven’t started packing him a lunch bag yet, but when I do, you better believe it will include a smiley face! At least until he becomes too cool for that. Haha. As far as the lunch itself, I always loved a good peanut butter sandwich. As I’ve noted before, I never liked jelly on my peanut butter sandwiches. Inevitably, the jelly would get smushed (that’s a technical term) and soggy. No thanks. Same with bananas. I love a good banana, but they just don’t hold up well when a Latin book or History book got shoved into my backpack next to the lunchbag. But one of my favorites? Crumb cakes. I can’t remember who made those little crumb cake muffins, but they were small packages with 2 mini crumb cakes inside. And I loved looking into my lunchbag to find those mini crumb cake muffins! I recently saw a box of those in the store, and as much as I loved ’em back in the day, I had zero desire to put that box in my cart. Instead, I had a desire to come home and bake my own batch of Crumb Cake Muffins. And woah. Delicious. I’m pretty sure I could have eaten the entire pan of these muffins. Heck, had my Mom had this recipe back in the day, I might have even allowed the smiley face to stay on my lunchbag! 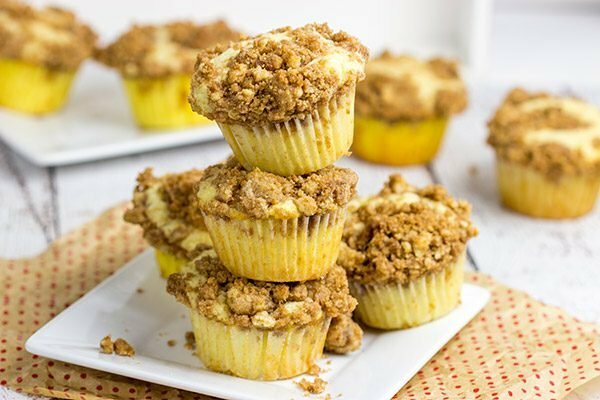 For these Crumb Cake Muffins, I started with my go-to crumb topping that I’ve used on all sorts of baked goods…most notably, coffee cakes. Then I just went with a very basic base for these muffins to let the crumb topping really shine. But with that said, the muffins themselves are legit. They’re basic, but don’t be surprised if this muffin recipe shows up again with the addition of blueberries, chocolate chips, raspberries, etc. It’s always nice to have a go-to recipe, and this muffin base is a good go-to recipe to file away. The crumb topping itself needs no accolades. Those little brown sugar + cinnamon chunks could be eaten by themselves! We ate a couple of these muffins for breakfast, but then Laura ate another one for dessert that night. She peeled off the paper liner, grabbed a fork and proceeded to eat one of these Crumb Cake Muffins like a piece of cake. I shortly followed suit. 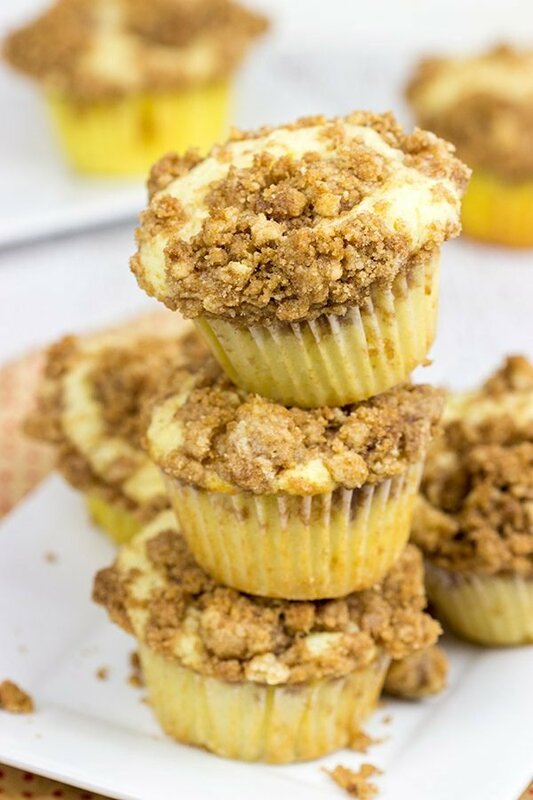 And I’m wrapping up this post now so that I can go up to the kitchen and eat the last of these Crumb Cake Muffins. Enjoy, my friends! 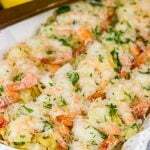 Oh, and if you try this recipe out, will you swing back by and let me know your thoughts? Or snap a photo and tag me on Instagram (@Spicedblog). Thanks! Add the flour; stir until well combined. Set topping aside. Line muffin pan with paper liners, or spray pan with nonstick baking spray; set pan aside. 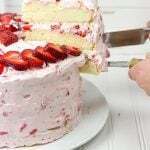 Using a large mixing bowl, whisk together flour, baking powder and salt. Using a separate bowl, whisk together sugar, sour cream, oil, eggs and vanilla extract. Fill each muffin cup ~⅔ full with batter. 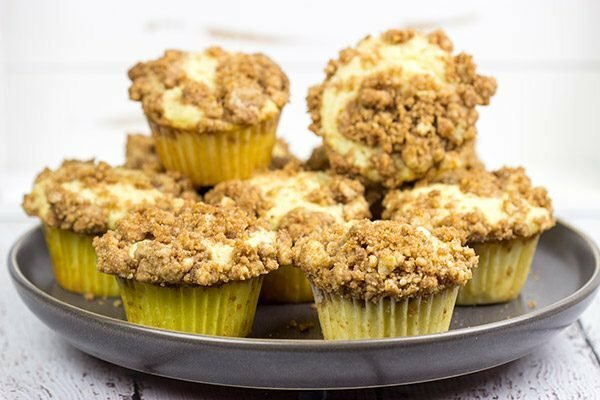 Divide Crumb Topping evenly on top of muffins. Bake at 375°F for 22-24 minutes, or until a toothpick inserted into one of the muffins comes out mostly clean. Haha! Well, that’s kinda what happened here, too, Kathy. I set out for the muffins to be breakfast, but surprisingly (!) there were still some leftover. So dessert is was! This is seriously my go-to recipe for muffins now. I’ve made 3-4 different muffins using this recipe as the starter. Hope you had a great Halloween, my friend. Next up – Thanksgiving! Haha! 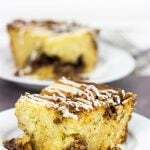 I’ve been working on a coffee cake muffin recipe but I just haven’t been able to get it exactly right–exactly the way yours look! I guess I can stop now and make yours instead because they’re perfection. Nothing beats a crumb topping right? PS–I love pb and j now but as a kid I refused it in my lunchbox because of how soggy the bread got. Glad I wasn’t alone! Haha! No way…nothing beats playing around in the kitchen and tweaking recipes. That’s the fun part! Although I have to say that I think these muffins are the mac daddy. (Do the cool kids still say that?) 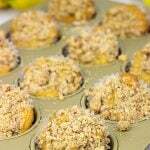 I’ve used this recipe for several other muffin varieties…it’s just a solid recipe! Also, we’re definitely related somehow. I’ve never met anyone else who understands (much less did it themselves!) my PB-only requirement for sammiches. Hope you had a spooky Halloween, Kelsie! Tell me about it, Dawn! That crumbly top. I could just eat top after top after top of these muffins. They’re so tasty! So a piece of cheese, eh? That’s different. I might have to try that one out…I mean I do love cheese! Thanks so much, my friend, and I hope you had a great Halloween yesterday! Hi David! Perfect timing! I’ve been making breads and muffins for Gary to eat in the morning (he gets up much earlier than I do) to tide him over until I make him breakfast. These are like personal coffee cakes! Do I love brown sugar and cinnamon? Absolutely! They are definitely calling my name! I would have loved to find them in my lunch bag as a kid – your mum sounds lovely so cute that she wrote your name and a smiley on the bag. I am sure Robbie is going to love it too one day. Have a wonderful weekend ahead, David! Miriam! Long time no chat, my friend. 🙂 I was just stalking your site this past weekend as we’re debating a visit to Porto for next year’s vacation. 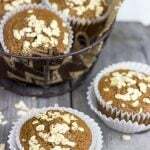 As far as these muffins, they’ve become my go-to muffin for sure! I love this crumb cake version, but now I want to make an apple cinnamon version. 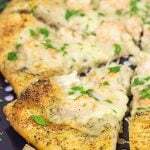 Maybe with some pecans on top? Yum! Banana sandwiches. Mushy banana sandwiches. That’s what I ended up with at my school lunches. Also from a brown bag! Ha ha! I was never as fortunate enough to get something as delicious as these crumb cake muffins in my lunch bag (I wish I had been). I always got a chocolate biscuit of sorts. Maybe I need to turn back the clock now and make a new lunch bag with these delights in! Banana sandwiches? Ergh. I mean a banana sandwich sounds interesting enough by itself, but if it became mushy? No thanks! 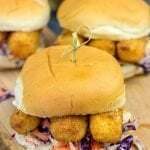 I say we revolutionize school lunches by including crumb cake muffins in every brown paper bag! Hah. These muffins really are my favorite new breakfast. Yum! Yes! I do love sugar and cinnamon, especially when there is butter involved (aka crumb topping!) And I definitely didn’t have anything like this show up in my lunch bag growing up! Hah! 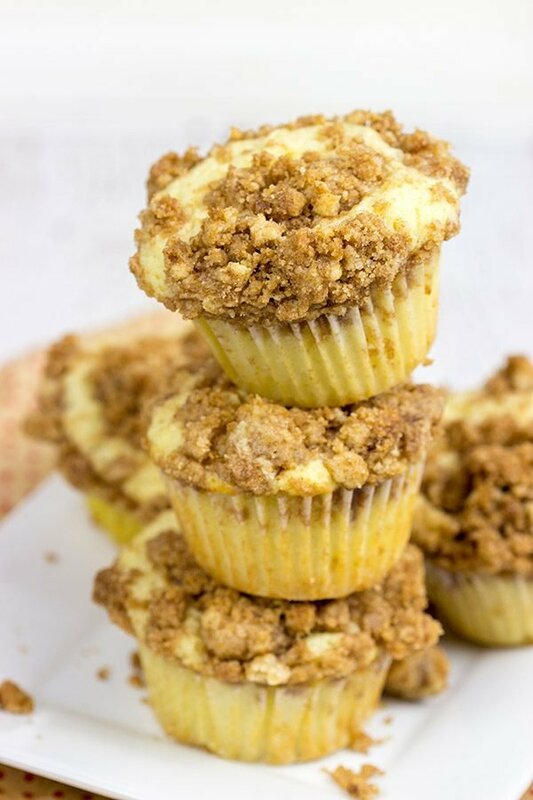 I’m fairly certain I would be happy if I looked into my lunchbag and found a batch of these crumb cake muffins. They are definitely my favorite new breakfast! That crumb topping….yum! Thanks, Marissa! I love a good muffin and I love a good crumb topping. These muffins sound yummy. I would love them for breakfast or to find one in my lunch bag. Crumb cake is one of my favorites, as I love the brown sugar + cinnamon combo! Now that I think back to it, my mom used to leave notes in my lunch box as a kid, something to the effect of “Have a great day! Love, mom” – aww, our moms were so cute with their little notes! That brown sugar + cinnamon combo is legendary. I mean everything is better with a brown sugar – cinnamon crumble on it! 🙂 It’s fun thinking back to those lunch notes. I know I thought they were kinda corny, but it was all done out of love for sure!